You are here: Home » MEDIA » Books » World Of Water (A Dev Harmer Adventure) by James Lovegrove (book review). 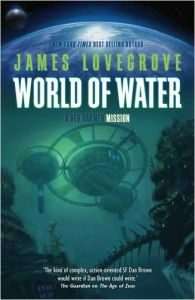 World Of Water (A Dev Harmer Adventure) by James Lovegrove (book review). ‘World Of Water’ is the second outing for James Lovegrove’s newest hero, Dev Harmer, following on from ‘World Of Fire’, which I reviewed here in October 2015. I’ve recently interviewed James about the new book and his writing more generally. The interview should go up on SFCrowsnest around the same time as this review. Dev Harmer is an agent for Interstellar Security Solutions (ISS), a secretive organisation tasked with keeping an uneasy peace between humanity and its aggressive neighbour, the religiously fanatical race of artificial intelligences known as Polis Plus. ISS send their agents to emerging trouble spots on the borders of the human diaspora to assess whether Polis Plus is stirring up trouble and, if so, to stop them dead. However, given how slow physical space travel is, ISS instead dispatch their agents digitally, by downloading their consciousness, beaming it to the destination planet and then uploading it to a vat-grown clone body appropriate to the local conditions. This time round, Dev finds himself on the planet Triton, a water world right up on the border with Polis Plus space. His first surprise is the body he’s been ported into. He now has webbed hands and feet, nictating eyelids and gills. He’s basically half-man, half-fish. His local ISS contact, who looks very similar, tells him that this is because the planet has an indigenous species of intelligent beings. These Tritonians are amphibious and, since it will probably be necessary for Dev to make contact with them, he’s been given a body that will make that job easier. Unluckily for him, though, the vat-grown body into which his consciousness has been downloaded is faulty. He’s left with at most three days to solve the case before his body dies! In addition to the native life-forms, Triton has been colonised, though not very heavily. There are only around forty thousand human colonists spread across a handful of settlements and two military bases. Dev has been sent there because of a recent rapid increase in the number of attacks on these colonists by Tritonians. The suspicion is that the attacks are being fomented by Polis Plus agents. Dev’s mission is to find out if that’s true and, if so, to remove the source of the trouble before it leads to all-out war. Dev is introduced to the local military, who lend him a company of marines and a boat. They agree to take him down south to the main human population centres, since trouble is most likely to break out there. On the way, though, they pick up a distress signal from a whaling ship. They divert their vessel to investigate, with alarming results. The crew of the whaler has been murdered, gutted and hung on hooks. It looks like revenge for what they’ve done to the local whales. As they’re checking for any survivors, the ship is fired on and they realise that they’ve fallen into a trap! Tritonians are trying to sink the whaling ship with them on board. In the process of getting out of that scrape, Dev finds out that the Tritonians have split into two opposing camps. One group, inspired by ancient religious tales of a vengeful sea god, are committed to wiping the human colonists off the planet as violently as possible. They are opposed by a second group of secular Tritonians, who reject violence and want to find a way to peacefully co-exist with the colonists. Dev continues with his mission, aided by both the marines and the secular Tritonians. Trouble is, the attacks on the human settlements are getting more vicious by the minute and he has a nasty habit of getting caught up in the middle of them. Will Dev be able to find out what’s really going on or will he become another casualty of the very violence he’s been sent there to stop? Like any book in a series linked by the main character, ‘World Of Water’ would fail if Dev Harmer was not a sufficiently strong protagonist. That’s not a problem here, though. Dev initially comes across as a wise-cracking smartarse, like the kid we all knew at school who could never pass up any opportunity to take the mickey out of the teacher. If that was all there was to him, I’m pretty sure readers would tire of him very quickly. Soon enough, though, we start to see the ‘real’ Dev behind the public mask. In a situation where most of the human colonists, including the marines he’s working with, misunderstand and dislike the indigenous Tritonians with a vengeance, Dev manages to build alliances with them and even shows pity to a young, headstrong Tritonian insurgent that they capture, as he reminds Dev of himself as a teenage tearaway. What emerges is an irreverent and likeable action hero who has a heart and a brain to go with his undoubted fighting skills. I’d certainly be happy to have him on my side in a scrape. However, it’s not only the lead character that provides interest. The company of marines, led by Lieutenant Eydis Sigursdottir, are rough, tough and one hundred per cent female. Their banter, particularly about Dev, is as consistently crude as you might expect from an all-male outfit but when they find themselves in a fire fight, the marines prove themselves able and resilient, even when they take casualties. Equally, the secular Tritonians are led by a female whom Dev nicknames Ethel since her real name is too complicated to pronounce in English. She quickly builds trust with Dev and, as the story unfolds, Ethel pulls Dev’s feet out of the fire at least as many times as he helps her. Her actions also help Dev and the reader to see that at least some of the native Tritonians are intelligent, brave and honourable. They are not just ‘sea monkeys’ as many of the colonists have insultingly nicknamed them and the violent insurgents in their ranks are not representative of the entire species. A key element in this series of books is the setting, with Dev Harmer being sent to a different kind of planet in each novel. The water world of Triton is a central character in this one, with its aquatic nature influencing every element of the storyline. Lovegrove describes the environment with great attention to detail that takes you right into the thick of the action. For example, when Dev and Ethel are forced at one point to dive their submarine into the depths, to escape from attack, the description of the sights that surround them when they are far below the surface made me feel like I was watching a documentary by David Attenborough. In addition to the characters and the setting, the other main point that struck me about this book was the way in which Lovegrove has taken a nominally trivial starting point, of writing a pulp-inspired SF adventure yarn and used it to explore serious contemporary issues such as religious extremism, colonialism and the politics of the far right. Yet these issues are fully integrated into the story, so at no point does it feel like Lovegrove is trying to lecture us. My one minor gripe about this book is nothing to do with the storyline. Instead, it’s about the typeface used for the non-verbal communication between Dev and the Tritonians. There’s quite a lot of this dialogue throughout the second half of the book and it was so small and in such an unclear font as to be almost illegible. This made the reading experience less enjoyable than it should have been. On the other hand, I’ve got nothing but praise for the story. Lovegrove keeps up a frenetic pace throughout, putting Dev in harm’s way time after time until you start to wonder why he hasn’t had a nervous breakdown yet. The marines and the friendly Tritonians who ally with Dev are fully realised characters who provide tremendous depth and interest and Lovegrove sustains the central question in the story of who is behind the Tritonian insurgency right to the very end of the book. Dev Harmer is a classic SF action hero and ‘World Of Water’ showcases his talents, along with those of his creator James Lovegrove, to great effect. I’m already looking forward to finding out what Dev does in his next outing, ‘World Of Air’. « Awesome science fiction and fantasy round-up (Offworld Report: Saturday 28th May 2016).